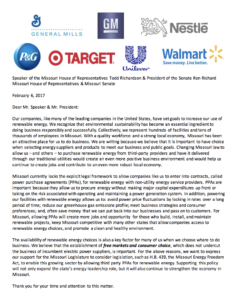 In February, seven major companies delivered a letter to the Missouri House of Representatives and Senate expressing their support for H.B. 439, the Missouri Energy Freedom Act, which would allow third party power purchase agreements (PPAs) for renewable energy. PPAs allow companies to procure renewable energy without making major capital expenditures up front or taking on the risk associated with operating and maintaining a power generation system. The companies emphasized the importance of having choice when selecting energy suppliers and products to meet their business and public goals. Read the letter here.